We were hit by a monster storm earlier this week, but after all the rain, thunder and lightning, it feels like summer has finally arrived. 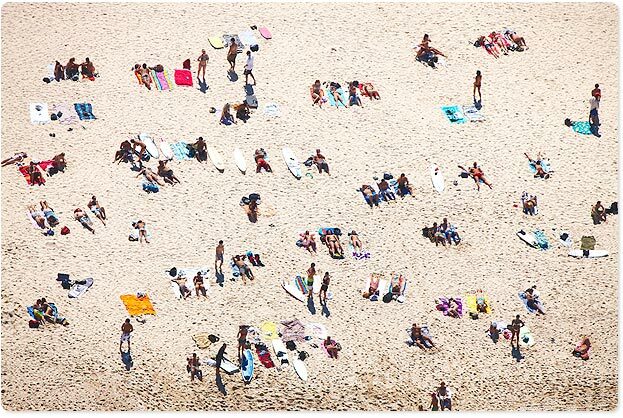 The weather’s been beautifully warm all weekend, the light’s been golden and Bondi has been packed. Early summer (and early fall) are my favorite times of year. It’s weird to think of mid-October as “early summer”, but that’s how life goes for us here in the Southern Hemisphere. I love this time of year not just for the weather, but for the food. Plump blueberries, bright strawberries, sweet papaya and juicy mangoes have flooded the market aisles. Fresh ears of corn, bunches of kale and piles of multi-coloured tomatoes are overflowing from their crates. Summer is a time of both abundance and lightness. It’s the perfect time for salad. Here’s the all-star I whipped up today. Isn’t it pretty? I made a big batch and stuck it in the fridge. The worst thing, if you’re trying to eat healthy, is to come home from work or the gym, tired and hungry, and find yourself resorting to Thai delivery. I’ve been guilty of this many a time, so I now use my Sundays to prep for the week ahead and make sure I have something nutritious and filling on hand. This salad is completely vegetarian and uses quinoa as the base, which means it’ll stay good in the fridge for several days. 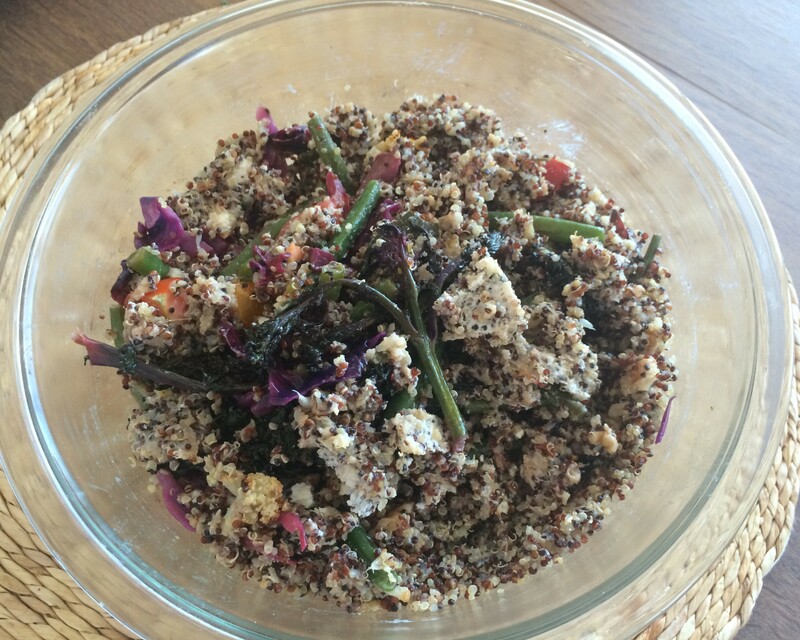 Quinoa, in case you’ve been living under a rock, is loaded with protein, fiber and minerals. It’s also gluten-free and low GI, which means it’ll keep you feeling full longer. 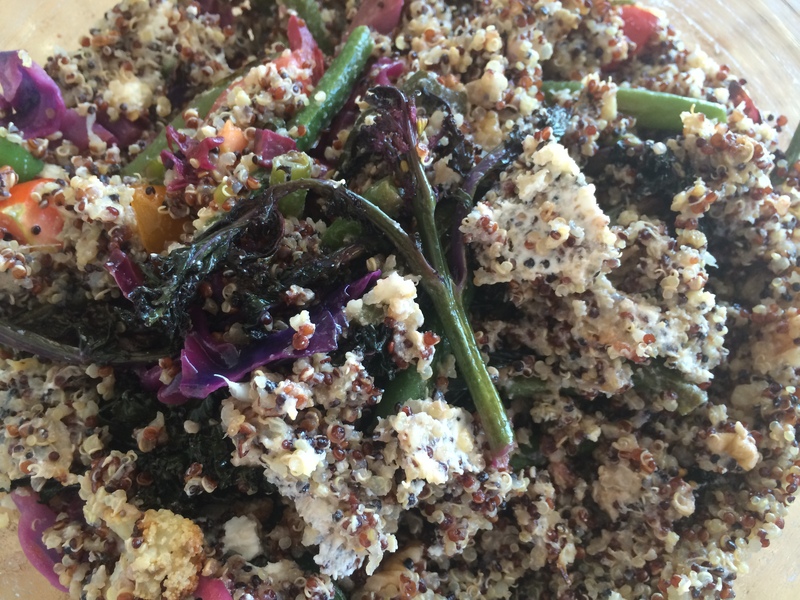 Quinoa is so nutritious that it’s been designated a “super-crop” (not just a super food!) by the UN Food and Agriculture Organization. Demand for the seed has exploded over the last few years and led to price swings and short supply. If you’re cooking with quinoa for the first time, the most important thing to keep in mind is to wash it extremely thoroughly. 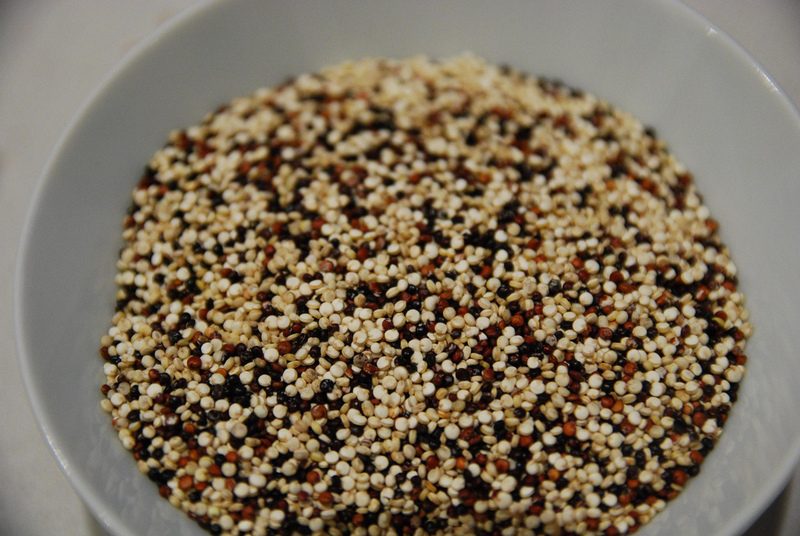 Unwashed quinoa is coated in saponin, a bitter-tasting substance that protects it from birds and insects. Warning: cooking your quinoa without first giving it a good rinse may result in an unhappy stomach! Rinse the quinoa thoroughly and place in a big pot with roughly twice the amount of water. I like to throw in a cube of vegetable bouillon once the water heats up. It brings a wonderful flavor to the quinoa and makes it delicious by itself. You could also use homemade veggie stock if you prefer. To cook the quinoa, bring the water to a boil and simmer on low heat until all of it has been absorbed (about 15 minutes). Fluff and set aside in a big bowl. In the meantime, prep your veggies. I like to roast my zucchini and cauliflower with a little bit of olive oil, salt and curry powder. I recently discovered this deceptively simple roasted cauliflower recipe by Summer Tomato and it’s become my go-to. It involves first steaming the cauliflower by covering the roasting tray with some foil and then roasting uncovered to get the florets all brown and crispy. Yum! Now for the other veggies. When it comes to green beans, I like to blanch them: throw them into a pot of boiling water with some salt, drain with a slotted spoon after 2 minutes and plunge into an ice bath to halt the cooking. Set aside. 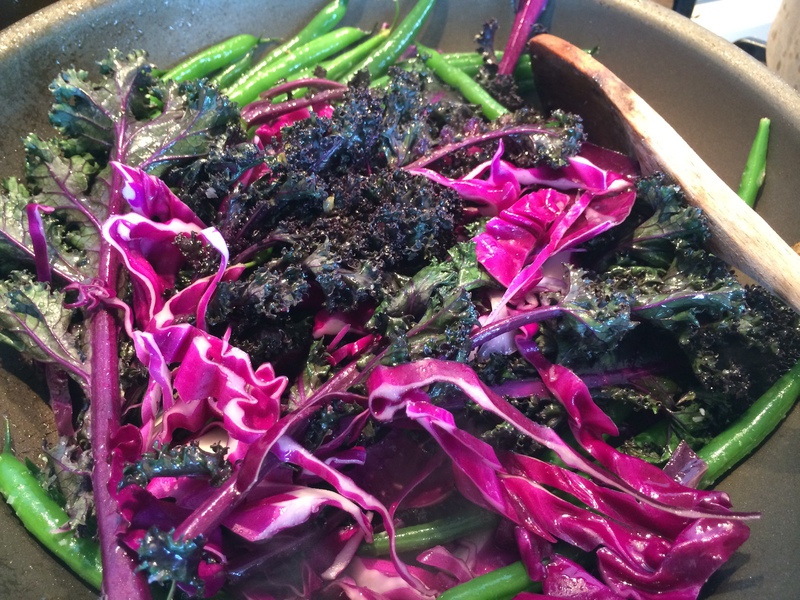 Next, throw some olive oil, garlic and ginger paste into a frying or sauté pan and drop in the green beans, the thinly sliced red cabbage and a handful of kale. I used baby purple kale because it doesn’t need slicing or de-stemming and cooks faster than regular kale. Add some salt and give your veggies a good stir. Cook until the cabbage and kale are wilted and tender (5-10 minutes). Time to assemble your masterpiece! The quinoa should be nice and cool by now. Crumble a handful of walnuts (or almonds) and stir them through. Next, add your sauteed kale, cabbage and green beans and mix in your roasted cauliflower, zucchini and fresh halved tomatoes. The juices from the veggies will add some depth to the flavor, but we’re not done yet: crack open that jar of Persian Feta and scoop out a big hunk. I’m obsessed with Persian Feta. It’s very popular in Australia and is basically a marinated, less salty and more versatile version of its Greek cousin — I eat it slathered on Turkish bread, on kebabs / in wraps and as a dip. It works perfectly in this salad because it’s creamy and flavorful but retains its form as you distribute it through the quinoa and veggies. Harris Farms does a beautiful Persian Feta with garlic and dill (not pictured), but if you aren’t able to get it locally, you could sub it with goat cheese or you might consider making your own. 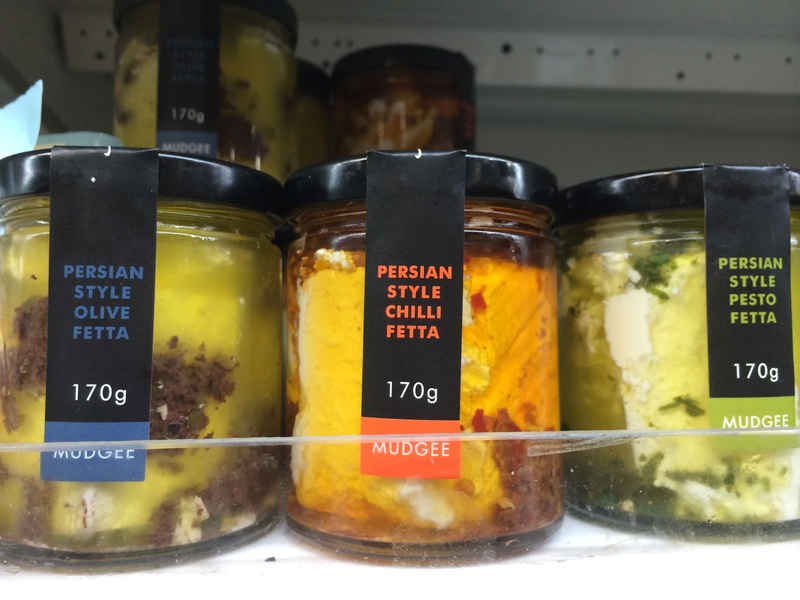 A fellow blogger in Paris has an easy guide to marinated feta right here.